Result-oriented business leader with 19 years of experience in the area of Strategy Definition, Revenue Generation, New Market Development, Sales and Execution. KK has been part of mobile ecosystem, seeing it evolve from mVAS to mAdvertising. He has worked with clients in over 15 countries from America to Australia and from Malaysia to Mexico. He has been part of early growth at companies such as Microsoft, Rediff and InMobi. 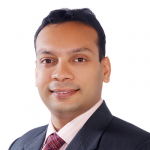 Presently he is with Flipkart, where he leads publisher development, as part of ad solutions group.